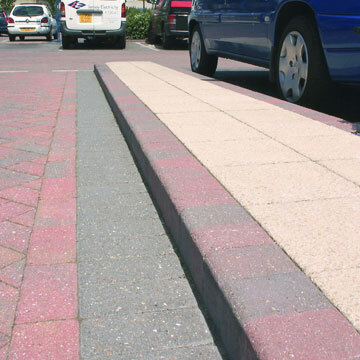 Kerbs and edgings provide a vital boundary between vehicle, pedestrianised and landscaped areas. As part of urban design they visually separate surfaces as well as perform the vital function of containing the pavement or driveway construction. Whether you need a heavy duty, roadside or decorative kerb, our range incorporates a comprehensive selection, developed to add the perfect finishing touch for driveway and paving designs. Civils and Lintels work closely with Marshalls to provide a wide range of high quality flags, kerb and edging products. Our range of flags and kerb includes British standard kerb, KeyKerb, channel kerb, angles and quadrants. British Standard Kerb – This sleek, highly durable and precision-manufactured concrete kerb system has been incorporated into highway schemes up and down the UK. British Standard Kerb uses hydraulic pressing in the manufacture of standard natural kerb, channel and edging to provide consistent long-term performance. Manufactured to the dimensions required in BS EN 1340:2003, this product is available with a wide range of ancillary products to allow for seamless integration with a minimum of cuts. Marshalls KeyKerb – A range of units designed to perfectly complement Keyblok, the UK’s most popular concrete block paving, on schemes where sharp detailing cannot be compromised. As well as providing a perfect colour match, a full range of ancillary shapes is available including radii, droppers and angle stones, to ensure that each landscape is fully functional as well as visually appealing. Designed for use with all styles of block paving, Keykerb is available in two sizes and in bullnosed, half battered, splay and chamfered profiles. 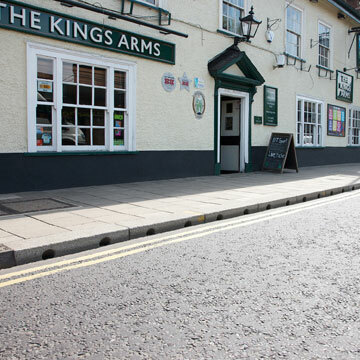 Marshalls Channel Kerb – Dished channels provide an aid to drainage as essential spacers between kerbs and carriageways as well as off-road parking and lay-bys. Highly durable, these hydraulically pressed natural-coloured concrete units are precision-manufactured from local aggregates. Keyedge colour edging offers a cost-effective attractive outdoor finish for housebuilding schemes, with four colour options, a standard smooth surface finish and a chamfered profile. This versatile concrete edging provides an integrated landscape solution that perfectly complements Marshalls’ existing product ranges. Marshalls KeyEdge – For a practical and durable finishing touch, Keyedge Concrete Coloured Edging has been designed specifically for housebuilding applications. Used in conjunction with other products from the Marshalls Keyblok paving and flags collection, they complement and integrate with each other, creating an attractive, unified space outside a new build. With dimensions of 50mm x 150mm x 800mm and a chamfered profile edge, this edging comes in 4 colours: Bracken, Brindle, Buff and Charcoal. The selected colours work with and contrast against the other Marshalls paving products.